Tim McGraw and Faith Hill were honored with the Humanitarian Award at CRS this week. Among their many charitable efforts was last year's superstar concert benefitting flood relief. Last year's winner Trace Adkins presented the award. The KCRS Live! songwriter showcase, presented by Stroudavarious Records, featured Aaron Lewis, LoCash Cowboys, Rivers Rutherford and Jeffrey Steele. The performers are pictured here with Stroudavarious execs. 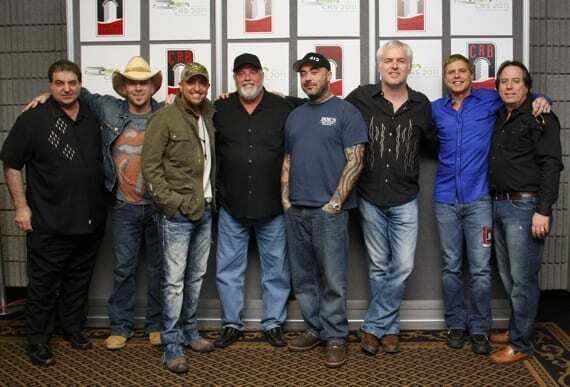 L-R: Bill Catino, LoCash Cowboys, James Stroud, Lewis, Rutherford, Steele and Bill Macky.